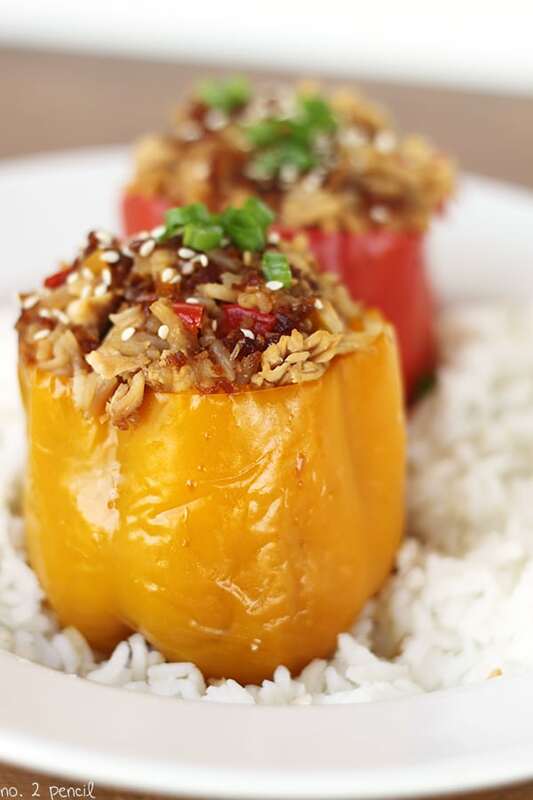 I’m thrilled to share this recipe for Asian-Style Slow Cooker Stuffed Bell Peppers. 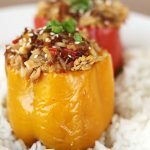 My Crock Pot Mexican Stuffed Bell Peppers are one of my very favorite, and most popular recipes, and this is a delicious Asian-style twist. Just like my Chicken Pot Pie Soup, these bell peppers are made with rotisserie style chicken, making it a snap to through together! Start with four large bell peppers, I prefer to use red, yellow or orange. 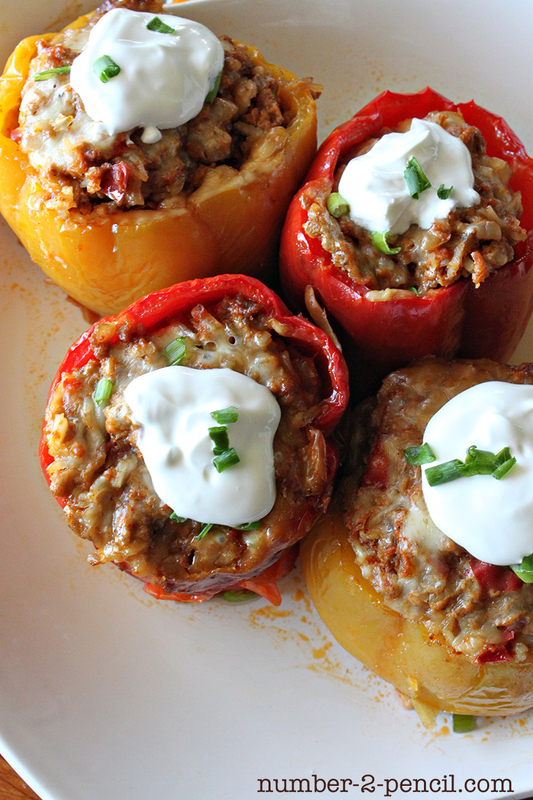 If you can fit more bell peppers in your slow cooker, feel free to increase the recipe. It’s very flexible. Slice the tops off the bell peppers, remove the stems and dice. 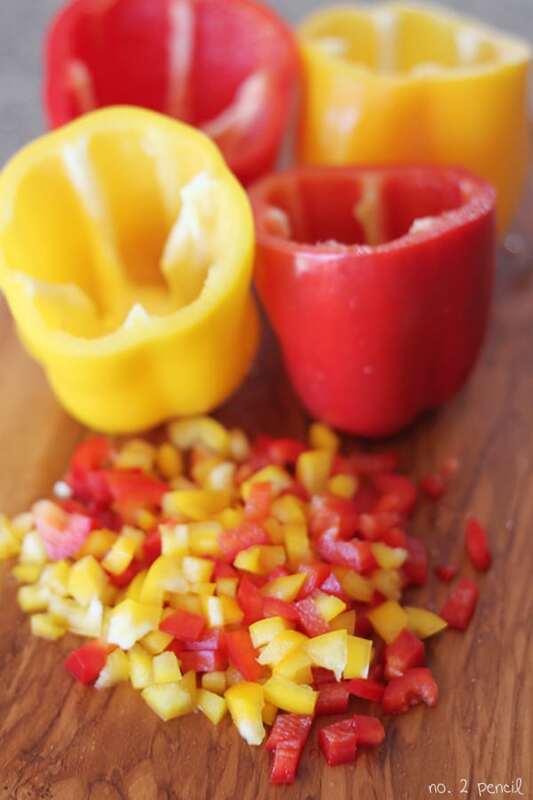 Remove seeds from inside the bell peppers. In a large bowl, combine cooked white rice, teriyaki sauce, shredded cooked chicken and diced bell peppers, mix together well. Fill bell peppers with chicken and rice mixture and set in slow cooker. 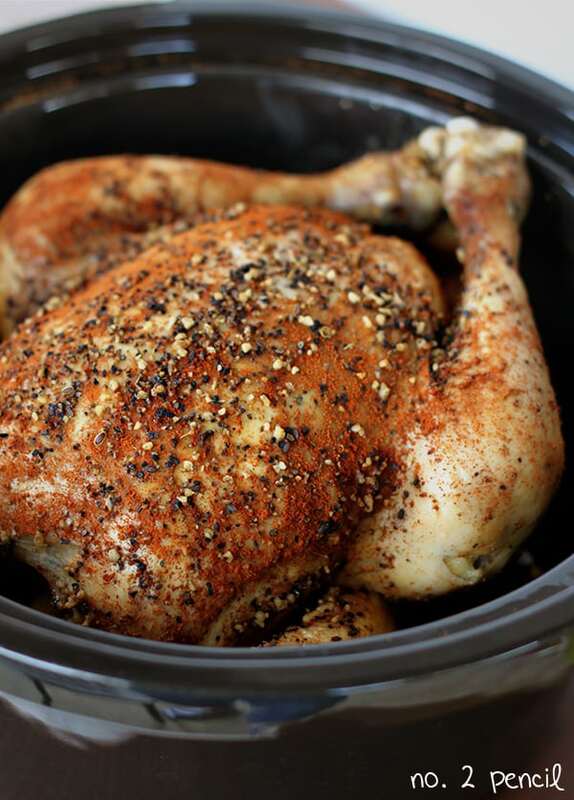 Pour 1/3 cup of water into the bottom of the slow cooker and cook on low for 3 1/2 – 4 hours or until bell peppers have softened and cooked through. Slow cooker times will vary. 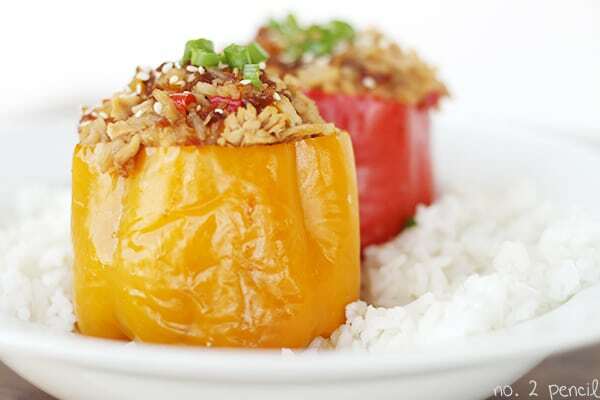 Easy and delicious Asian-style bell peppers in the slow cooker. 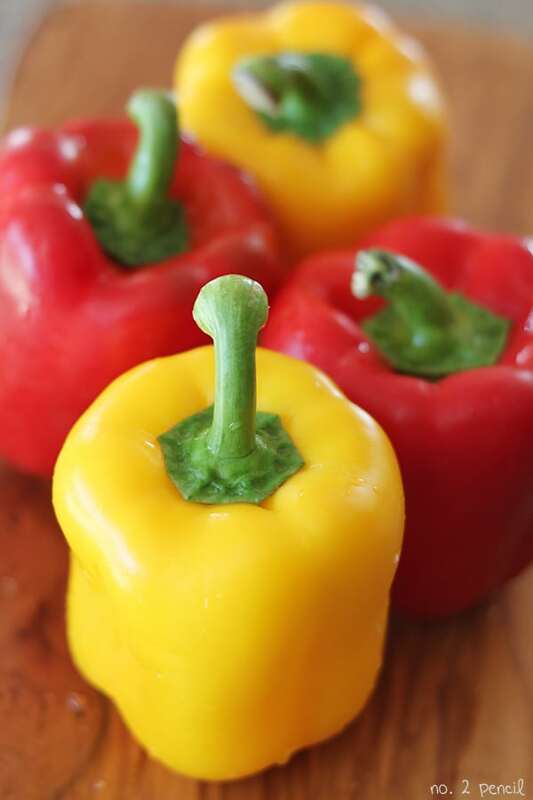 Slice tops off of bell peppers, remove stems and dice. Remove seeds from bell peppers. 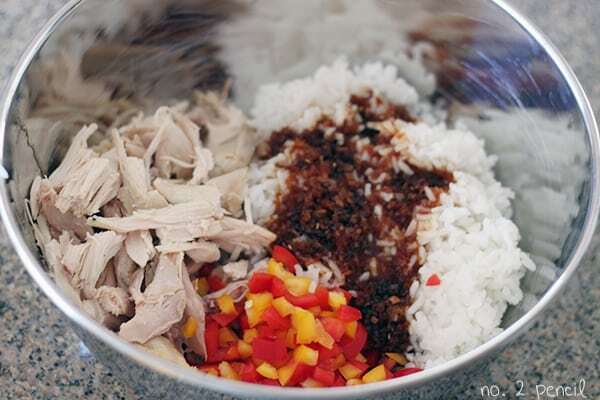 Combine cooked chicken, cooked white rice, teriyaki sauce, and diced bell pepper tops in large bowl. 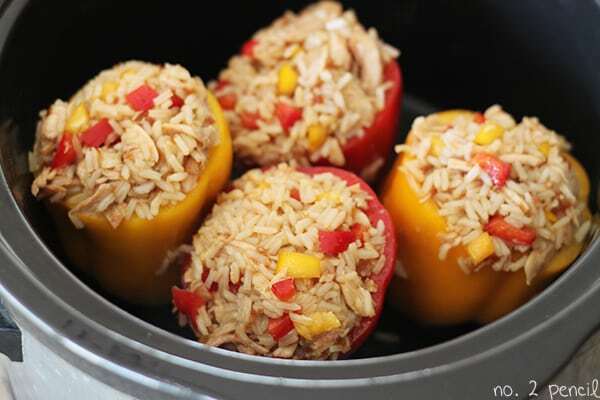 Stuff bell peppers with chicken and rice mixture, and stand upright in slow cooker. Pour 1/3 cup of water into bottom of slow cooker and cook on low for 3 1/2-4 hours or until peppers are soft. Garnish with diced green onions and sesame seeds. Serve with additional teriyaki sauce. 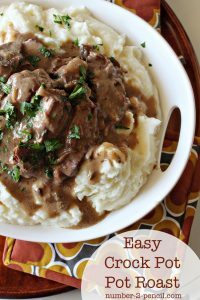 I kid you not when I say that I just jumped online to look for a good slow-cooker meal and here this was! YUM! Adding this to my grocery list! 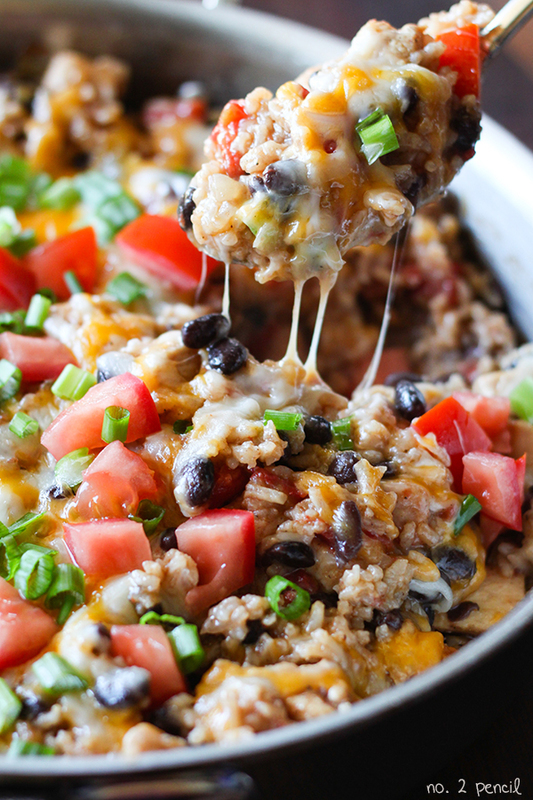 Oh Melissa these look delicious! 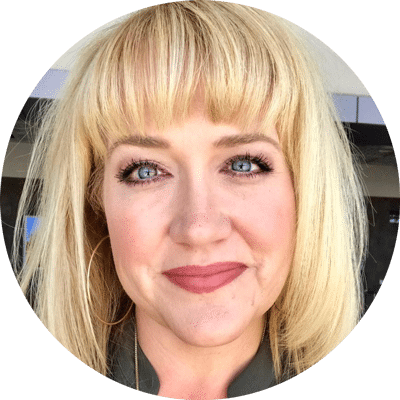 I just made stuffed bell peppers in the slow cooker for the first time last month–life changing! I’ve always boiled the peppers on the stove top and then cooked them in the oven!